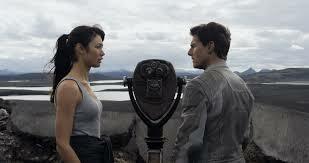 Now that "Oblivion" is out on DVD, here is a reprint of my review from April. Forget about custody battles, tabloid gossip, couch jumping and religious obsessions—Tom Cruise is the real deal. This guy is a true movie star in the old school, classic meaning of the term. Cruise also has a knack of picking great projects with strong material helmed by bold, innovative, creative, and often legendary directors. This is an actor who has worked and collaborated with Martin Scorcese, the late Tony Scott, Cameron Crowe, Paul Thomas Anderson, Oliver Stone, Steven Spielberg, and even the ultimate cinematic perfectionist (and not exactly actor friendly director) Stanley Kubrick. If Tom Cruise puts his name on a movie, it means quality. Even when he misfires such as in 2011’s vapid “Knight and Day”, he does it with an engaging flair that still entertains. This time the under-appreciated and notoriously hard working actor brings his classic star wattage to “Oblivion”, a throwback project designed to pay homage to classic 1970s old school science fiction films such as “Silent Running” (1972), “Logan’s Run” (1976) and “Alien” (1979). “Oblivion” is helmed by “Tron Legacy” (2010) director Joseph Kosinski and shares many of the characteristics and thematic obsessions of that underrated film. 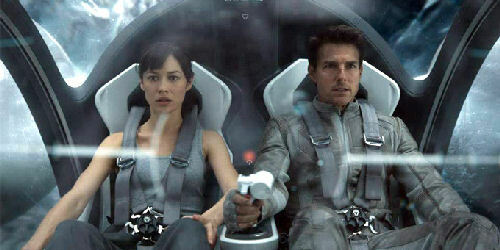 Put simply, “Oblivion” is a gorgeous piece of cinematic visual art. Every spec and minute detail of every design is crafted with an artistic flair and yet functional sensibility—from the costumes and outfits, to the super cool futuristic helicopter/space fighter jet that Cruises character flies. Every set is jaw-dropping, like something out of Syd Mead's or Ralph McQuarrie's dreams, especially the cloud city uber-slick futuristic pad where Cruise's character Jack Harper lives. Jack lives with his partner in both work and life, communications officer Victoria Olsen, played Andrea Riseborough with a wonderful, icy sexuality. 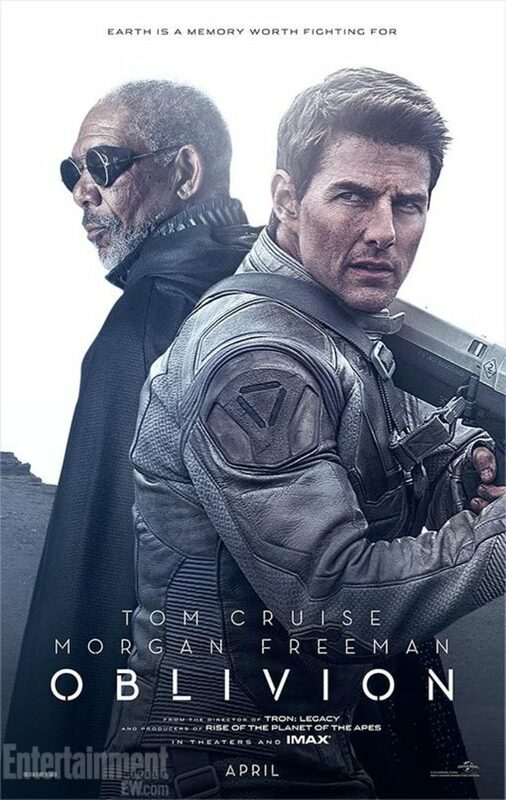 “Oblivion” is based on an unpublished graphic novel by the director and in keeping true to the spirit of the 1970s films it wants to emulate, the first hour of the film has a very deliberate and careful pacing. The plot lines begin to slowly unwind and the mystery deepens leading up to an second act that ends in a knockout exhilarating special effects sequence and a third act in which several revelations catapult the movie toward a moving and emotionally satisfying climax. “Oblivion” also benefits from the supporting presence of the sensational Olga Kurylenko from Showtime’s “Magic City” and the great “Morgan Freeman” as the leader of an underground revolution. 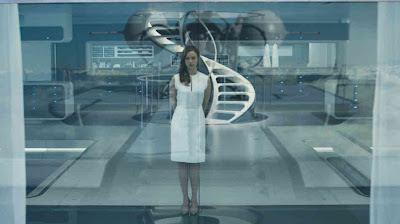 Another solid asset of “Oblivion” is the film’s musical score by M83, composed by Anthony Gonzalez and Joseph Trapanese. 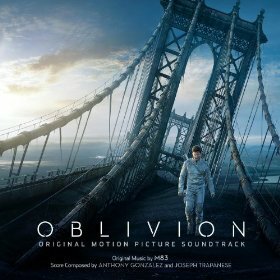 It is a hypnotic, melodic, and at times exciting soundtrack that does for “Oblivion” what Daft Punk’s music did for “Tron Legacy”. Bottom line, ignore what the bitchy critics whined about last spring. “Oblivion” is an entertaining and visually stunning throw back science fiction film anchored by the performance of an A-list movie star at the top of his game.